Transport IBC tanks | Large offer available from stock or custom-built. At Staes.com you can choose from a large stock of new and second-hand stainless steel IBC transport tanks. Upon request these IBC transport tanks can be adjusted to your needs and can be equipped with various agitators in our own workshop. If you prefer a custom-made tank, we will configure and produce the IBC transport tank based upon your requirements. If you have transport tanks for sale, we will make you a non-committal offer. 500 L -	€ 295/St. 500 L -	€ 325/St. EW5461V4N: brand new; transport tank; SS AISI 304 (V2A); vertical; single-skin; 565 L; maximum density= 1.900 kg/m³; type of tank: IBC-PL. We can take more containers in production for you. The standardised PL IBC containers which we offer from our stock are not applicable for food use. We can offer this type for food use, however it comes with an additional cost. 565 L -	€ 1.544/St. 800 L -	€ 799/St. 800 L -	€ 399/St. EW9772V4: second-hand; pressure tank; SS AISI 304 (V2A); vertical; single-skin; 800 L. Some tanks have minor deformation to the ring welded on the top of the tank, please do look at all the pictures. 950 L -	€ 699/St. 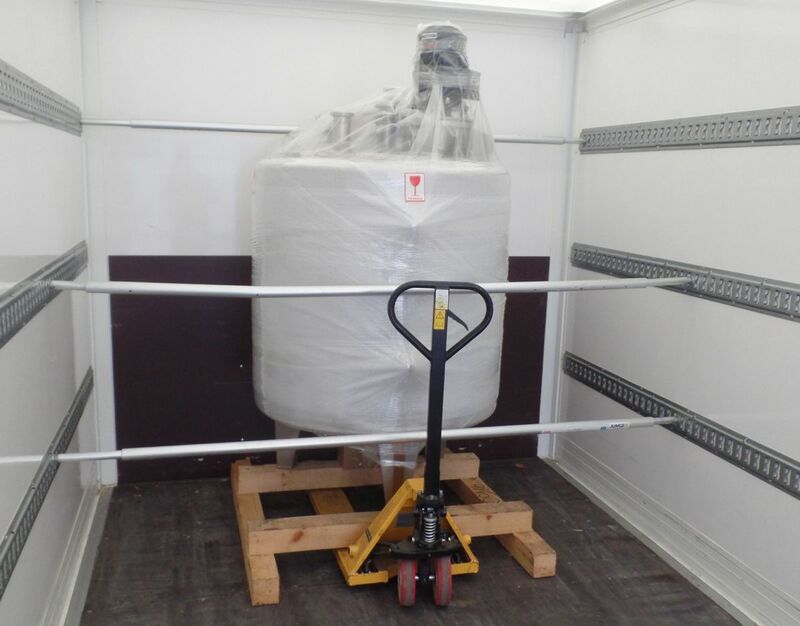 EW5481V4N: brand new; palletized transporttank (for ADR); SS AISI 304 (V2A); vertical; single-skin; 995 L; maximum density= 1.900 kg/m³; type of tank: IBC-PL0. We can take more containers in production for you. The standardised PLO IBC containers which we offer from our stock are not applicable for food use! We can offer this type for food use, however it comes with an additional cost. 1.000 L -	€ 2.415/St. EW10008V4N: brand new; palletized transporttank (not ADR); SS AISI 304 (V2A); vertical; single-skin; 1.000 L; maximum density= 1.900 kg/m³; type of tank: IBC-PL. We can take more containers in production for you. These standardised PL IBC containers EW10.008V4N which we offer from our stock are applicable for food use. 6 of the 7 tanks have a butterfly valve instead of a ball valve.